I haven't really watched it yet but I've seen them all a few days ago during a blogcon in Quezon City. 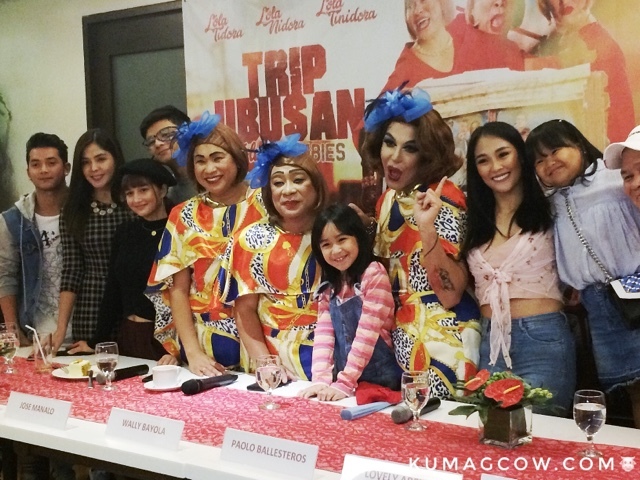 Clad in full make up, funky shoes and colorful dresses, the three Lolas Nidora, Tidora and Tinidora will be headlining a full movie showing tomorrow in theaters nationwide. Now this just puts the whole KALYESERYE story in a different level. Honestly I'd be really afraid to gamble in a movie that doesn't include popular loveteam ALDUB but as I've learned, there will be tons of side stories in this film that will only make sense if you connect the two love birds in the mix. A daughter? Who knows but judging from the name of the character itself, the kid possibly maybe Alden and Yaya Dub's very own, but to find that out you have to watch the movie. Aside from Jose Manalo, Wally Bayola and Paolo Ballesteros, you will see other stars like Angelika Dela Cruz, Ryzza Mar Dizon, Arthur Solinap, Rochelle Pangilinan, Lovely Abella, Taki Saito, Kenneth Medrano, Archie Adamos , Jayvhot Galang, Caprice Cayetano, Al Tantay, Joshua Zamora, Niño Mulach, and my love Shaira Mae Dela Cruz who I'm shipping with Miggy Tolentino in this film. Miggy and Shaira by the way have already established a following in TROPS which is another show they are doing under TAPE Incorporated. Hopefully these guys would get even more attention now from the fans who also like them like I do. I had the chance to interview them separately so enjoy this one! Remember that this shows on November 22, 2017 and if you've got nothing to do on this date go find your friends and family and invite them to watch this film that talks about family, horror, comedy and how these Lolas survive it all. Will they be able to protect their apo Charmaine (played by Caprice Cayetano)? 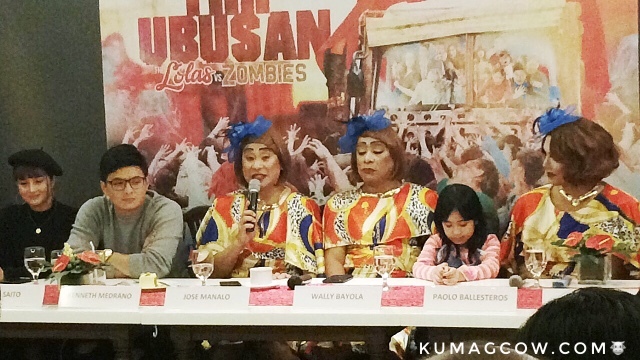 Watch them battle with zombies on theaters because this will surely be fun!